Draft: 2012, San Francisco Giants, 5th rd. Ty would watch Rockies games with the same focus he gave to school studies...His family often went to Coors Field, where Ty developed a routine...Before taking his seat he used the bathroom, got a hot dog and stopped by the speed pitch booth, where onlookers gaped at the little kid throwing over 55mph...Once he sat down, he didn't move...Ty is a devout Catholic...His autograph includes the notation Matthew 6:33 ("But seek first his kingdom and his righteousness, and all these things will be given to you as well. '')...An autograph he got from Rockies infielder Terry Shumpert as a kid included the Biblical reference and Ty never forgot....He later contacted Shumpert to let him know how much it meant to him...Attended Creighton University and finished his threeyear collegiate career with a 2.76 ERA to rank second in school history...Ty majored in finance at Creighton...He left school when he was drafted by the Giants in 2012 at the end of his junior year...He had just one semester left to earn the degree in finance...He completed it in 2013 and he graduated with honors that December. Was the Giants' Opening Day starter, becoming the first Giants' pitcher to start the season opener other than Madison Bumgarner, Matt Cain or Tim Lincecum since 2008 when Barry Zito was the club's Opening Day starter...In his first career Opening Day start on March 29, he tossed 5.0-shutout innings, allowing just three hits in the Giants' 1-0 victory at Los Angeles-NL...His 26 career Major League starts were the secondfewest of any Giants' Opening Day starting pitcher since 1958...in 1982, LHP Al Holland was the Giants' Opening Day starter and he had just three previous MLB starts (Stats, LLC)...Was moved to the bullpen on May 29...His best start of the season came on May 5 at Atlanta.. threw a season-high 7.2 innings, allowing two runs (one earned) on seven hits in the Giants' 11-2 victory over the Braves...Posted a 3-1 record with a 3.17 ERA (19er, 54.0ip) in 34 relief appearances...Was optioned July 25 and then recalled July 26 as IF Brandon Belt was placed on the injured list...Made a spot start on August 11 vs. Pittsburgh and threw 4.0 innings, allowing four runs on four hits with five strikeouts...Struck out 75 batters in 118.2ip...his 5.69 strikeouts per 9.0 innings was the sixth lowest in the NL (min. 65.0ip). Finished the season with an 8-12 record and a 4.78 ERA (87er, 163.2ip) in 34 games (24 starts)...Made his first Opening Day roster as the Giants' lone left-hander out of the bullpen... made seven relief appearances, allowing three runs in 5.2 innings pitched (4.76 ERA) before being added to the rotation on April 25 in place of LHP Madison Bumgarner, who was placed on the disabled list...As a starter went 8-12 with a 4.81 ERA (80er, 149.2ip) in 24 starts...Earned the win in four consecutive starts from May 16-June 2, becoming the first Giants' rookie to win four-or-more consecutive starts since Madison Bumgarner (4), July 6-24, 2010 (streaks exclude any relief appearances & are broken by any no decisions) (Stats LLC)...His best stretch of the season was from May 11-June 2, where he pitched at least 7.0 innings and allowed three runs or fewer in five-straight starts, while posting a 4-0 record with a 1.91 ERA (8er, 37.2ip)...Struggled over his last five starts from Aug. 14-Sept. 5, going 0-5 with a 7.90 ERA (24er, 27.1ip) and a .303 opponents average...was moved to the bullpen and made his final three appearances as a reliever...Allowed 0.93 home runs per 9.0 innings over his 34 appearances, which was tied for the seventh-lowest ratio in the National League... after allowing just 10 homers over his first 19 starts, he gave up seven home runs over his last five starts...His 2.36 walks per 9.0 innings ranked as the fifth-lowest figure in the NL...he allowed 30 walks in his last 18 contests (2.72 walks per 9.0ip) after allowing just 13 walks over his first 16 appearances (1.82 walks per 9.0ip)...On June 2 at Philadelphia, he threw his first career complete game shutout...threw 112 pitches while allowing seven hits and issuing no walks in the Giants' 10-0 victory...On Aug. 3 vs. Oakland, he crushed his first career home run, a 416-foot, three-run shot to center field...became just the third Giants rookie pitcher to drive in at least three runs in a game since the team began playing in San Francisco in 1958, joining Jim Duffalo (four in 1961) and Brad Hennessey (three in 2005) (Elias). Rookie southpaw went 1-0 with a 1.06 ERA (2er, 17.0ip) in four games (two starts) after being called up by San Francisco on Sept. 1...Was recalled from triple-A Sacramento on Sept. 1, marking his first callup to the big leagues...the Aurora, Colorado native made his Major League debut on Sept. 5 at Colorado, tossing 3.0-scoreless innings of relief...On Sept. 25 at San Diego, Blach made his first career start in place of RHP Johnny Cueto, who missed his start with a groin strain...he allowed two runs on four hits and three walks with three strikeouts in the Giants' 4-3 loss...Made his second career start on Oct. 1 vs. Los Angeles-NL and tossed 8.0-scoreless innings... became just the fourth Giants rookie pitcher to throw 8.0-or-more scoreless innings against the Dodgers in a winning effort...Recorded two hits off Clayton Kershaw on Oct. 1...became just second ML pitcher to record two hits off Kershaw in a game...Compiled a 14-7 record with a 3.43 ERA (62er, 162.2ip) in 26 starts with triple-A Sacramento...His 14 wins were the most in the Pacific Coast League and his 3.43 ERA ranked sixth...Blach also led the PCL in innings pitched (162.2ip), complete games (three) and tied for the lead in shutouts (two)...Was named a Pacific Coast League Pitcher of the Week two times, a PCL All-Star, and the PCL lefthanded Pitcher of the Year. Posted an 8-8 record with a 3.13 ERA (49er, 141.0ip) and 91 strikeouts in 25 starts for double-A Richmond....Was named to the Eastern League mid-season All-Star team....Finished fifth in the Eastern League with a 3.13 ERA....Was a non-roster invitee at Giants' Major League Spring Training for the first time in his career. Spent all of last season working in the triple-A Sacramento starting rotation, going 11-12 with a 4.46 ERA in 27 starts...His ERA jumped from 3.13 during the 2014 season in double-A to 4.46 in the hitter-friendly Pacific Coast League in 2015....Led the PCL in innings pitched (165.1ip)....Was selected for the 2015 Rawlings Gold Glove Award for defensive excellence at pitcher...Blach was perfect in the field during his 2015 campaign at triple-A, not committing an error in 53 total chances...he recorded 14 putouts and 39 assists....Was added to the Giants' 40-man roster on November 20, 2015....Was a non-roster invitee at Giants' Major League Spring Training for the second consecutive year. Had a superb season on the mound for Class A Advanced San Jose posting a 12-3 record with a 2.79 ERA (42 ER, 130.1 IP) and 117 strikeouts...Won the California League ERA title (2.90 ERA), finished tied for second with 12 wins and had the second-lowest WHIP (1.09)...Walked only 18 batters compared to 117 strikeouts in 130.1 innings pitched...Was named to the California League mid-season and postseason All-Star teams...Was named Best Starting Pitcher in all of Minor League Baseball by MILB.com, based on fans' votes...Along with teammate Mac Williamson, was honored as the San Jose Giants co-Most Valuable Player...Struck out a career-high 11 batters over 8.0-shutout innings against Inland Empire on May 21...he allowed just three singles and issued one walk during his 98-pitch performance, as he at one point retired 20 out of 21 batters...Went 23.2-consecutive innings without issuing a walk from April 25-May 21...Allowed two runs or fewer in nine-consecutive outings from June 8-Aug. 2...Enters the 2014 season rated by Baseball America as the Giants' eighth-best prospect in their minor league system. 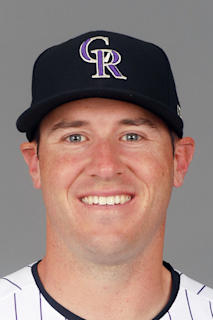 March 26, 2019 San Francisco Giants optioned LHP Ty Blach to Sacramento River Cats. July 26, 2018 San Francisco Giants recalled LHP Ty Blach from Sacramento River Cats. July 26, 2018 San Francisco Giants optioned LHP Ty Blach to Sacramento River Cats. October 7, 2016 Ty Blach roster status changed by San Francisco Giants. October 5, 2016 San Francisco Giants reassigned LHP Ty Blach to the minor leagues. September 1, 2016 San Francisco Giants recalled LHP Ty Blach from Sacramento River Cats. March 20, 2016 San Francisco Giants optioned LHP Ty Blach to Sacramento River Cats. November 20, 2015 San Francisco Giants selected the contract of Ty Blach from Sacramento River Cats. July 16, 2015 Sacramento River Cats activated LHP Ty Blach from the 7-day disabled list. April 8, 2015 LHP Ty Blach assigned to Sacramento River Cats from Richmond Flying Squirrels. February 2, 2015 San Francisco Giants invited non-roster LHP Ty Blach to spring training. April 2, 2014 LHP Ty Blach assigned to Richmond Flying Squirrels from San Jose Giants. January 13, 2014 San Francisco Giants invited non-roster LHP Ty Blach to spring training. January 31, 2013 LHP Ty Blach assigned to San Jose Giants. June 20, 2012 San Francisco Giants signed LHP Ty Blach.